It is the post-lunch TV hour at Arushi and the mood among the girls who live here is buoyant. When a television actor (Rajat Tokas) appears on screen, I am taken aback by the dozen-odd flying kisses thrown at him by my fellow viewers. The conversation veers quickly towards who adores whom. “Please write that Sapna loves Salman!" says Sapna. “And that Himesh is Pooja’s favourite!" pleads Pooja. “Asha here prays for Rajat Tokas all the time!" says a girl—not Asha—with a giggle. Asha turns slightly red, then smiles and looks accusingly at the girl who has volunteered this information. Just five months old, Arushi, which houses 47 girls, is the fifth shelter home for children opened by the Delhi-based NGO, Salaam Baalak Trust (SBT). Over the past 20 years, SBT has provided a home, education and future to many street children in Delhi. Tucked away among a row of houses in a pleasant residential Gurgaon colony that is still in the process of shedding its rural vestiges, Arushi houses girls aged between five and 18. These girls either don’t have families or their families are too poor to take care of them and have left them here. The home reminds you of a clean and well-maintained, if somewhat spartan, students’ hostel. Its spacious dorm-style rooms, built over three levels around an atrium with a sunroof, are neatly ordered and have bunk beds. There is a dining area on the ground floor which also serves as a common room. Classrooms, an amphitheatre and a TV room are being built in the basement. If Arushi’s unplastered and unpainted walls indicate that budgets were tight, then their patterned red brick and (polished) concrete finish also shows that the aesthetics of the building has been thought through. Plaques on the walls show that funding for Arushi came from corporations, both Indian and multinationals, as well as from the American and Japanese governments—a testimony to the confidence and trust SBT’s work inspires. All of which does not obviate the need for volunteers to give a leg up to the young wards of Arushi in what remains an uphill struggle for a decent future. On a weekday morning, volunteers from the Motorola corporation come in identical yellow company polo shirts to tell the kids about the environment—this involves a drawing contest with a green theme, a short cartoon film, some talk about why trees and forests should be preserved and, best of all, pizza for lunch. It is after the pizza that I sit with five girls selected by Rai and try and converse with them in English. Husna is in class VI, Heena and Ritu are in class V, Aarti in class VIII and Yashi in class II—their ability to speak English is limited. “There are things we can write," says Husna in Hindi. “But it is harder to talk in English." She is 13 and says she wants to be an astronaut like Kalpana Chawla. I am curious about how much the girls will understand if I read something out and ask Husna for her English textbook. Continuing with the green theme, I decide to read out The Giant Stone of Tears, a story adapted from a Tajik folk tale. It traces the friendship between a giant rock and a peepal tree that ended with the tree being felled by thoughtless humans. The girls understand only a little but listen attentively and follow the story as I explain it in Hindi. As I read to the girls, I can’t help but think that they are easier to handle than their more affluent peers. Unfailingly courteous, they are careful not to betray any signs of impatience even when their attention is straying. This could be for a number of reasons— maybe I am a naturally gifted teacher or, more likely, they are hungrier than other children to learn and want to make the best of the cards life has dealt them. “We look for long-term volunteers," says Sanjoy Roy, a founder trustee of SBT. “Anything less than six weeks is a waste of time for both—the children and volunteers." Roy says volunteers who can teach are always welcome—it could be English, science, math or how to use computers. SBT has full-time tutors on its rolls, but Roy points out that the sheer number of children and their vastly varying levels of education require all the extra help they can get. “If someone wants to just play with the kids or tell them stories, they are welcome too," he says. Doctors and specialists willing to treat the children are always welcome. Money: Parikrma runs four schools which give underprivileged kids quality English-medium school education. A donation can go to their “invest in a child" programme, which focuses on the requirements of one child. Half a day’s salary as part of their Change Your World initiative can also be paid for. Time: People can help children with remedial classes or engage with them in outdoor activities such as basketball and swimming, read stories to them, or take them to the planetarium. Money: Sponsorship for a girl child studying in classes I to VII costs Rs1,800 per month, and for a girl child studying in classes VII-X, Rs2,000 per month. The sponsorship money is used for material support, including stationery, books, uniforms, shoes and academic support beyond school hours. Time: Nanhi Kali is a sponsorship project for underprivileged girls and works with 25 NGO implementation partners at the grass-root level, hence there is no scope for direct volunteer participation. Money: Donors can pay for the educational and vocational training of children, their food, the rent for their Lado Sarai shelter or the day-care centre near Jama Masjid. Time: People can help with documentation, or website maintenance. They can teach the kids or work with the street theatre programme. Jamghat is planning 10 performances in New Delhi starting 31 October. 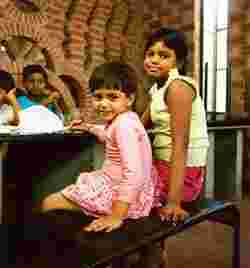 Situated in Madhyamgram, on the fringes of Kolkata, the Pranab Kanya Sangha (PKS) serves as an orphanage, school and crèche, all rolled into one, for about 70 girls, aged 6-18. Many girls here have been abandoned by families, while others have been entrusted to the Sangha by parents too poor to take care of them. The girls are engaged in academic and vocational pursuits within the institute’s lush green campus, where they live, study and play together. “I love my friends and would like to stay here as long as I can. I have a lot of toys to play with here," says four-year-old Chandana Hemrom, who has just started going to playschool. Too poor to take care of her, her parents sent her to the institute. An in-house primary school has 400 students from the institute as well as outside it and the Sangha administration arranges for the resident girls’ higher education. Some of them leave early to get married, while others pursue their studies or take vocational training to learn skills such as tailoring. To break the ice, I decide to organize a small general knowledge quiz for the girls. The alacrity with which hands go up to answer the questions is overwhelming. A right answer by one is greeted with a loud round of clapping by her mates, while a wrong one is booed. “Through every activity, we try to inculcate a sense of togetherness and responsibility towards society in these children," says Sanyasini Paramanandamayee, secretary of the Sangha and popularly called Sanyasi Didi. Pranab Kanya Sangha began with a handful of children in 1971 under the patronage of the Bharat Sevashrama Sangha—a non-profit charitable organization reaching out to the underprivileged around the world. 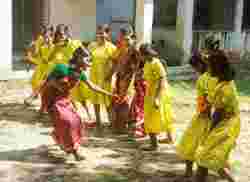 It has now branched out into various areas of West Bengal, the Andamans, Haryana, Maharashtra and Orissa, and is home to around 260 girls, also providing education and crèche facilities to many others. A donation of Rs5,000 to the Sangha can sponsor a child for one year (taking care of her education, accommodation, food, clothing and all other necessities). Long power cuts are frequent and the donation of a generator would be welcome. The institute is also looking for well-qualified female volunteers who can teach in a primary school.